The fact that the FBI did not take access to the DNC servers is a HUGE RED FLAG that the FBI, the Clinton campaign and the DNC acted in concert to cover up what was (and what was not) on the DNC servers, lending credence to the entire manufactured Russian hoax. - W.E. 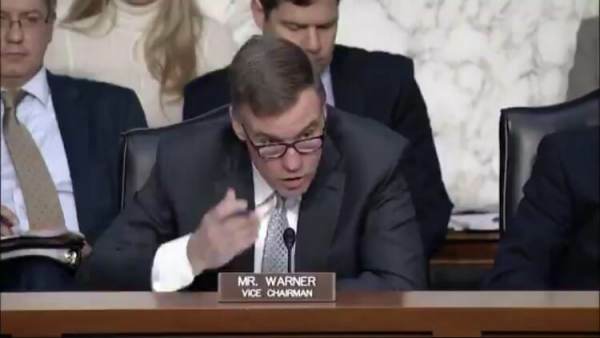 On Tuesday, Senator Mark Warner (D-VA) continued to push the Russian election hacking hoax at a Senate Intelligence Committee hearing on worldwide threats, yet investigators still have not inspected the DNC servers to confirm Russia hacked Hillary Clinton’s campaign emails. Senator Warner is the Vice Chairman of the Senate Intel Committee. Why doesn’t he want to take a look at the DNC’s servers? Senator Warner and other Democrats demanded to know what the Trump administration is doing to prevent the Russians from intervening in our elections. The top spy chiefs also said they expect the Russians to target 2018 and 2020 elections. “Last year those of you who were on the panel each expressed confidence in the January 2017 IC assessment that Russia interfered in the 2016 elections. I’d like each of you today to one, reaffirm that and also a simple yes or no Director Pompeo we have not seen a decrease in the Russian activity and we have every expectation that they will continue to intervene in our elections in 2018 and 2020,” Warner said. The Intel Chiefs responded to Senator Warner confirming the Russians will continue to attack our elections. The Russians always try to undermine our elections. This is nothing new. Neither the FBI nor any other federal investigators have inspected the DNC’s servers to confirm the Russians hacked Hillary’s emails. Why not? How do we have a Special Counsel investigating ‘Russian hacking’ yet no one has inspected the very servers that were supposedly hacked. The only cybersecurity experts to inspect the DNC servers was Crowdstrike, a private company hired by Hillary’s campaign. Also, none of the investigators have reached out to WikiLeaks founder Julian Assange who has stated many times on record that Russia did not give him the Podesta emails. This is more proof the entire Russia investigation is a complete sham.